I’ve been following Mike’s The Eye Dancers blog for a while now and impressed by the articles he’s written. His posts are well written, informative and the discourse is entertaining. I then received an email from Mike asking whether I’d be interested in a literary exchange. He suggested we buy and read each other’s work and leave reviews. What a great idea. I have since read his novel The Eye Dancers, you can read my review posted on Amazon and/or Goodreads. Not long ago I reached out to Mike and asked if he would like to be interviewed, which he kindly agreed. During the interview I was excited to learn Mike is writing a sequel to the book. Luciana: I liked the title of your book and as I read the story, the meaning becomes obvious. Did you start with the title of your book in mind or did it evolve as the story progressed? Mike: When I began writing the novel, I had no title! In fact, I didn’t have a title until very late in the game. It was really Mitchell Brant, one of the main characters in the book, who “gave” me the title. When he and the boys are floating through the endless blue void, he thinks of it all as “eye-dancing.” The title, of course, was later drawn from that! Luciana: I read in your blog, that each of the characters in the story in some way reflected a little of your personality. Are the experiences of the characters based on specific events in your own life? Or are they based on someone you know? Mike: The main characters are inspired by friends I knew growing up. I even incorporated some of the “in jokes” we used to share as a group! It was a lot of fun writing for Mitchell, Joe, Ryan, and Marc. Of the four main characters, I definitely relate the most to Mitchell. Certainly Mitchell shares some of the personality traits and hobbies I had when I was in junior high. Luciana: There is a bit of technical information on Quantum Physics which I particularly enjoyed. What is it about this field of science that drew you to write about it in the story? Mike: I love the layered approach to Quantum Physics. It is a mind-blowing field of study. I love the fact that our very thoughts can potentially shape the world around us. Quantum Physics tells us that, simply by observing something, we have the ability to reshape reality. This is a concept that plays a definite role in The Eye-Dancers. Luciana: What are your thoughts on Quantum Physics and the possibility of parallel worlds? Mike: I am a firm believer in it! I believe what we call “reality” is in fact much more complex and layered than we realize. Luciana: Who or what inspired you to write the book? Mike: First and foremost, my childhood friends—the adventures we shared, the questions we asked, the bonds we formed. I wanted to write a story about adolescence, growing up, confronting and overcoming personal hang-ups and expanding and opening the mind to appreciate different, broader points of view. 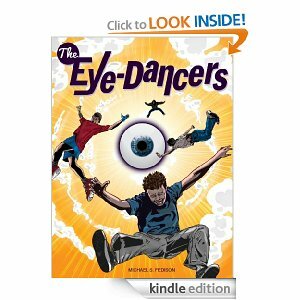 The Eye-Dancers explores the very concept of reality, and pursues the theme that we are all connected in some way or another—even to people, events, and histories in universes that seem so far away, but, in actuality, are closer than we ever realized or imagined. Luciana: Do you have any new works in progress that you can share? Mike: I am finishing up a small short story collection that will be available soon! I have also just begun work on a sequel to The Eye-Dancers. I really look forward to delving back into that world again. Luciana: Where can readers discover more about you and your work?